Boise State has teamed up with JCPenney to provide an opportunity for you to shop for career attire at an affordable price. During this event, JCPenney at Boise Towne Square will open exclusively for Boise State students to shop and receive an extra 40% off select career attire. Staff will be available to provide measurements and assist with your selections. Everything you need to finish your look for that next interview or new job – including suits, dresses, sport coats, dress pants, shoes, and accessories. 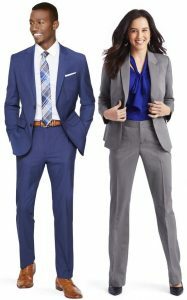 Select men’s & women’s career dress apparel & shoes. Show your Boise State student ID to get your special discount card. Stop by Sephora inside JCPenney for a chance to win prizes. Stop by for a free mini-makeover. Free salon consultation and XPress Bar hair touch up. Questions? Contact the Career Center at career@boisestate.edu, or (208) 426-1747.